The FlexiForce A201 force sensor is an ultra-thin, flexible printed circuit. The force sensors are constructed of two layers of substrate (polyester/polyimide) film. On each layer, a conductive material (silver) is applied, followed by a layer of pressure-sensitive ink. Adhesive is then used to laminate the two layers of substrate together to form the force sensor. The active sensing area is defined by the silver circle on top of the pressure sensitive ink. Silver extends from the sensing area to the connectors at the other end of the sensor, forming the conductive leads. A201 sensors are terminated with male square pins, allowing them to be easily incorporated into a circuit. The FlexiForce single element force sensor acts as a force sensing resistor in an electrical circuit. When the force sensor is unloaded, its resistance is very high. 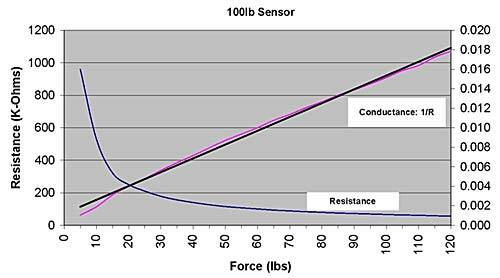 When a force is applied to the sensor, this resistance decreases. The resistance can be read by connecting a multimeter to the outer two pins, then applying a force to the sensing area. In the image below, the plot shows both the Force vs. resistance and Force vs. conductance (1/R). Note that the conductance curve is linear, and therefore useful in calibration. In this tutorial, you will going to learn on how to display the voltage level on 2×8 LCD and light up the LED based on the voltage level as the different force exerted to the Flexiforce Sensors(A201). You can refer the data sheet(attachment) before starting this tutorial. 5. Measured the resistance for the flexiforce sensors as it is unloaded and exert a large force to the sensor for the purpose of choosing a suitable resistor for voltage divider. Note: The resistance (~85kΩ) showed as the above was the max forced that I can exerted on the sensors. Different people may obtain different lowest resistance. 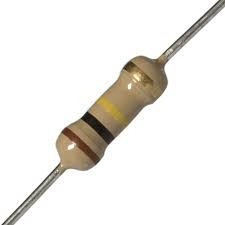 From the resistance obtained, the resistor of 100kΩ was chosen for the voltage divider purpose. Figure 5: The resistance of Flexiforce Sensors(A201) as different forced exerted on it. 6. Connect the circuit as the schematic provided as below. Note: The Op Amp such as LM324 can be used in here in order to amplify the output voltage. If the max output was low, LM324 will amplify the voltage level of the the output voltage to 5V by adjusting the Op Amp gain.The gain of the Op Amp can be calculated by A = 1 + (Rf/Rs). 7. Plug in the power supply. Exert force to the Flexiforce sensor and observed the voltage change with the force exerted by using digital multimeter. 8. The following show the some part of the sample source code..
main function: It will obtain the analog value and display it as decimal on the LCD. The Led will light up according to the voltage level reached. Note: The sample source file can be downloaded from the attachment below. 9. Load the source code the the BBFuino. Exert force to the Flexiforce sensor and observed the result. 1. Repeat the step 1 to step 4 in section Part 1. 2 Next, connect the circuit as the schematic provided. 3) The following show the some part of the sample source code.. The micro-controller used for this tutorial is PIC16F876A. main function: It will obtain the analog value and display it as decimal on the LCD. At the same time, Led will be turn on according to the voltage level. 4. Load the source code the the SK28A. Exert force to the Flexiforce sensor and observed the result. The TCS3200 color sensor uses a TAOS TCS3200 RGB sensor chip to detect color. It contains four white LEDs that light up the object in front of it. There are four controllable white color LEDs for natural lighting of the object. This tutorial will show you the basic operation on how to use this sensor. Arduino Duemilanova have come with 6 Analog to Digital Converter I/O with 10-bits resolution. In here, we going to explore on how to interface LM35 temperature sensor to Arduino and Display the output on Arduino LCD-Keypad shield. By using SKM53 GPS module, we can actually view our current UTC time, date, latitude, longitude and so on. In further application, it can used to interface with our smartphone, microcontroller such as Arduino or PIC, and so forth to know our own location. Meanwhile, when we use it, we need to expose it to the sky to capture the stronger signal. As an example, if we in the home, we need to put the GPS module near the window to get the signal. Otherwise, we will not receive the signal by GPS antenna if we inside a closed window room. Besides on directly connected 7 segment with direct I/O port from microcontroller, we can also use the CD4511 (7 segment encoder) to help on decreasing the microcontroller I/O port and only required to send the binary data.